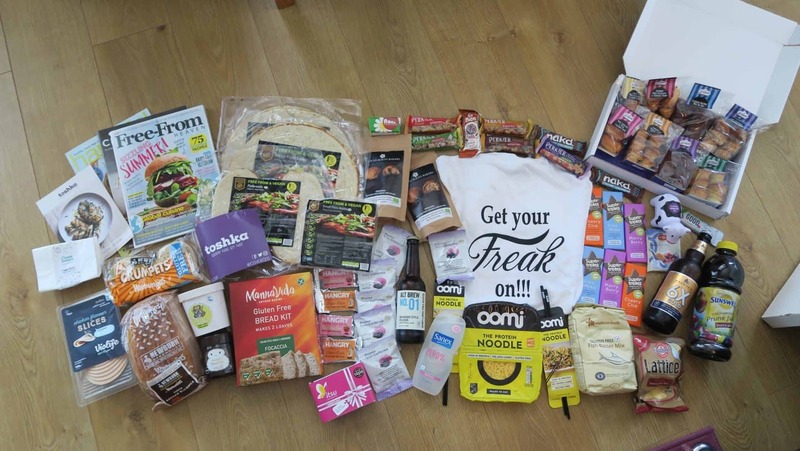 Allergy and Free From Show London: My gluten free and dairy free haul and favourites! The Allergy and Free From Show 2017: My complete gluten free haul! I promised a full reveal of my Allergy and Free From Show haul, and now I have managed to lug it all home, here’s a run-down of all the amazing brands I found and the goodies I tried at the show and took home with me. 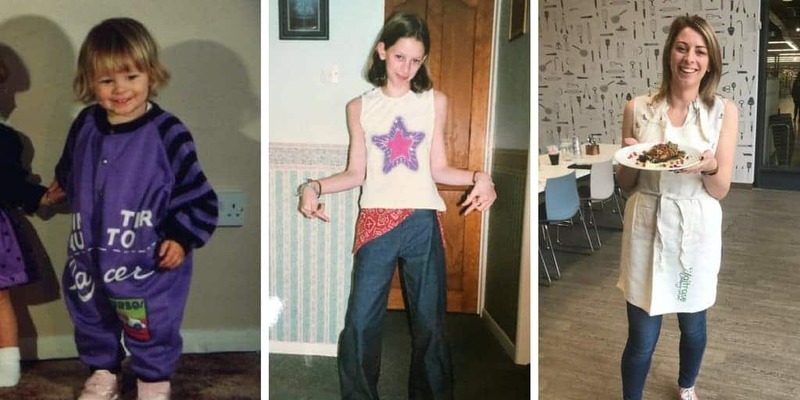 You might want to grab a cuppa, it’s a long one! You can also read my 8 highlights from the Allergy and Free From Show. I haven’t included them in this roundup, so make sure you check out that post as well! 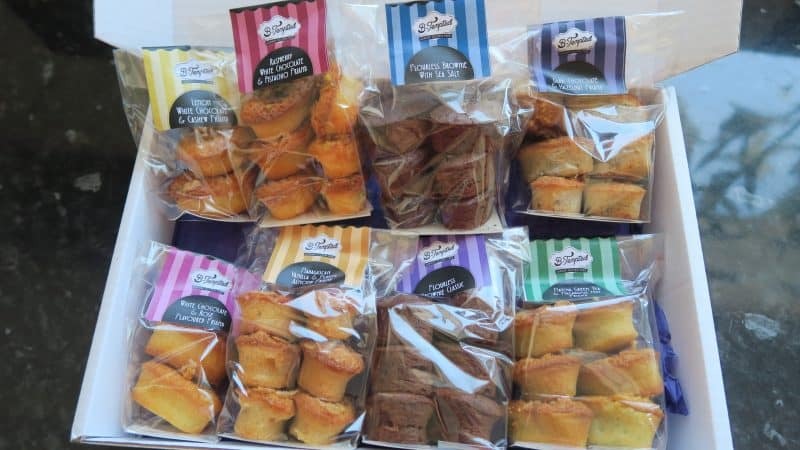 All of these brands are gluten free, some are dairy free, egg free, soy free and nut free as well – and I’ll try and list all the allergens with each product. If there are any I’ve missed, please let me know in the comments below! 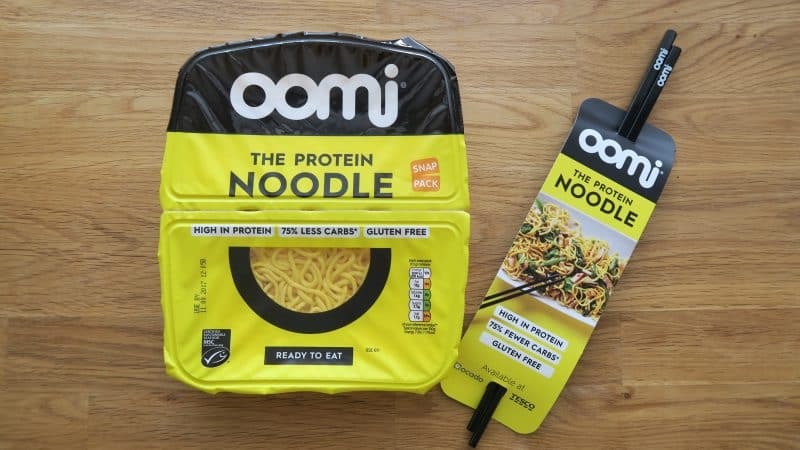 I’ve been intrigued by the idea of these gluten free protein noodles from Oomi for a while now – they look a lot like ‘real’ noodles – aka egg noodles – but they are made from fish! I was assured by the stand workers at the Allergy and Free From Show that they don’t taste like fish, but I’m so intrigued to try them. I like the idea of being able to eat them cold from the pack or heating them in a stir-fry. I picked up two gluten free beers at the Allergy and Free From Show. The first was from Alt Brew. I spent a while talking to the guys on the stand, who were lovely, and despite the fact I don’t really like gluten free beer, they persuaded me to try theirs. I was quite pleasantly surprised, it had a nice, light flavour. 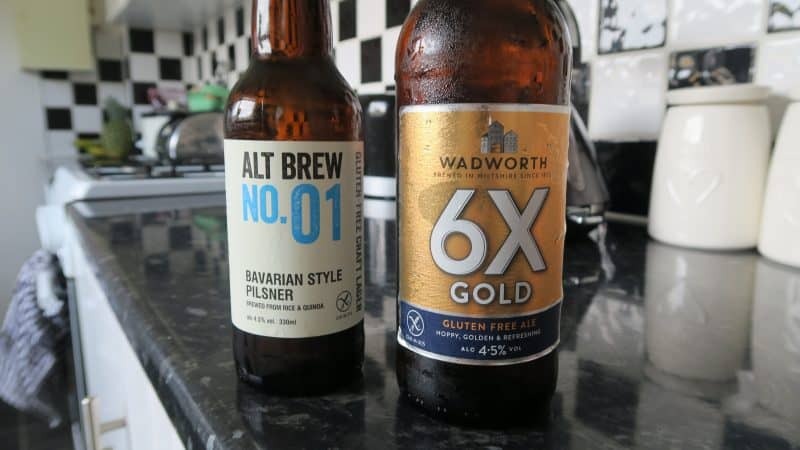 I was also give the 6X Gold from Wadworth, who told me this was a lot more ‘hoppy’. I’m not sure this will be my cup of tea (or pint of beer!?) but it seemed to have a good reception from the gluten free beer-loving coeliacs among us. I was very impressed with the bread from these mixes at the Allergy and Free From Show – I think they were one of my favourite stands. The bread tastes very ‘real’ and had a lovely texture. ANDREA (the owner) explained this was largely because the mixes don’t use rice flour. 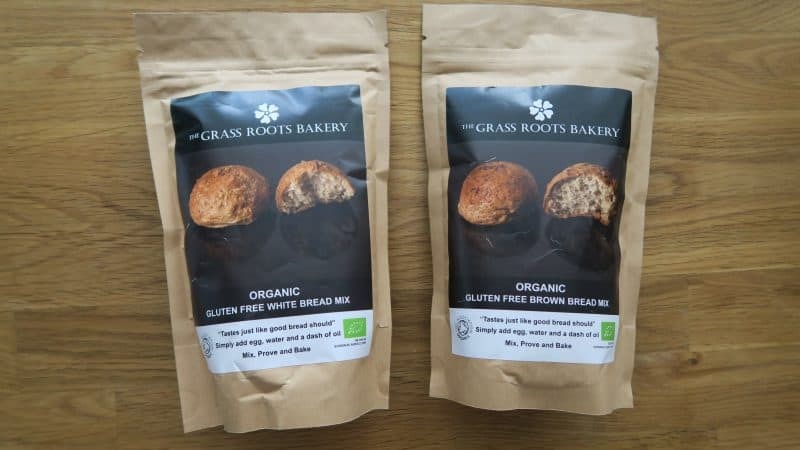 I have never really made gluten free bread before but I can’t wait to try these and it looks like a very simple recipe to follow, which is a bonus. I definitely picked up quite a haul of goodies and sweet treats, and there were a lot of brands exhibiting at the show with snack bars aimed at the ‘healthy’ market. Some of these I have tried before, but others were new to me and I can’t wait to see how they fare against the ones I already know. 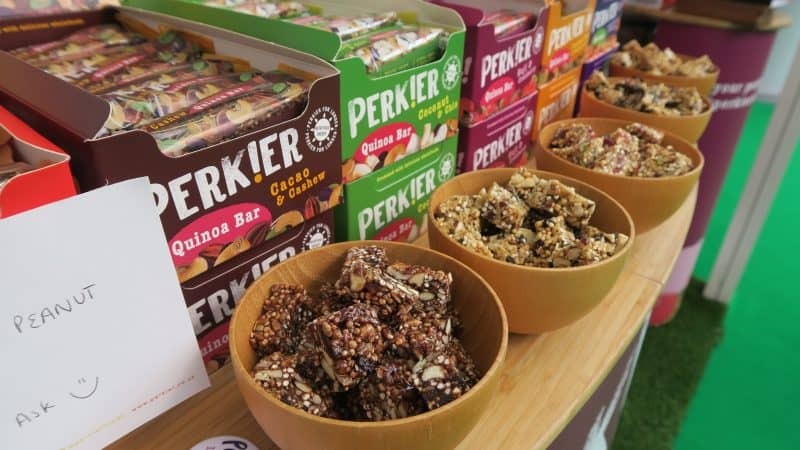 Perkier are one of my favourites and I absolutely love the flavour and texture of their bars. 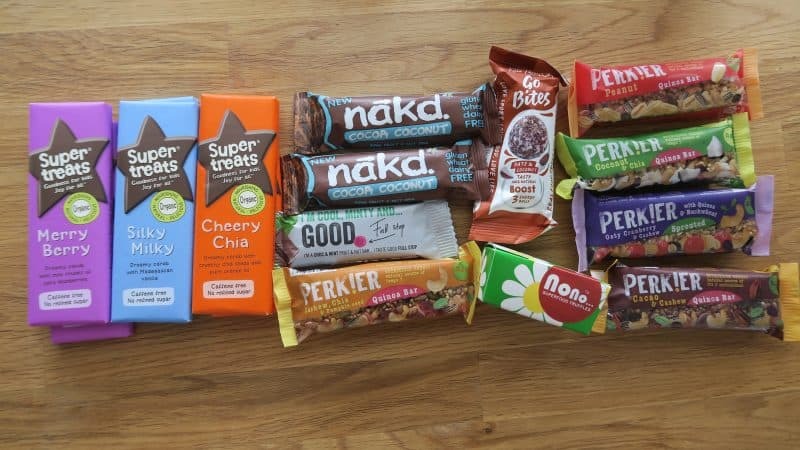 I have also tried the new Nakd cocoa and coconut bars before – they aren’t my favourite of their flavours but they are very nice. I haven’t tried the Good bar or the Go Bites yet, nor have I tried the Super Treats. A big thank you to the lady from Super Treats, as when I told her my boyfriend Steve loved carob, she gave me some extra bars for him! I’m excited to try the truffles from Functional Foods too. 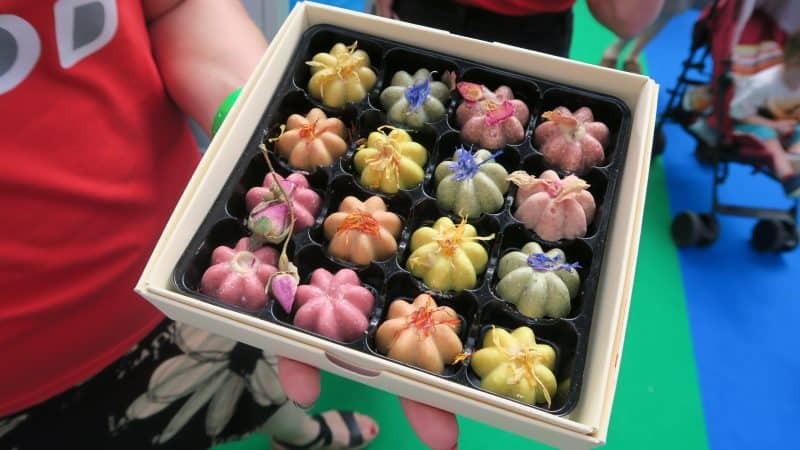 They had the most beautiful treats on their stand – I loved how they used superfoods to make their truffles and treats so gorgeous, the kind of thing you’d gift someone instead of a box of chocolates. 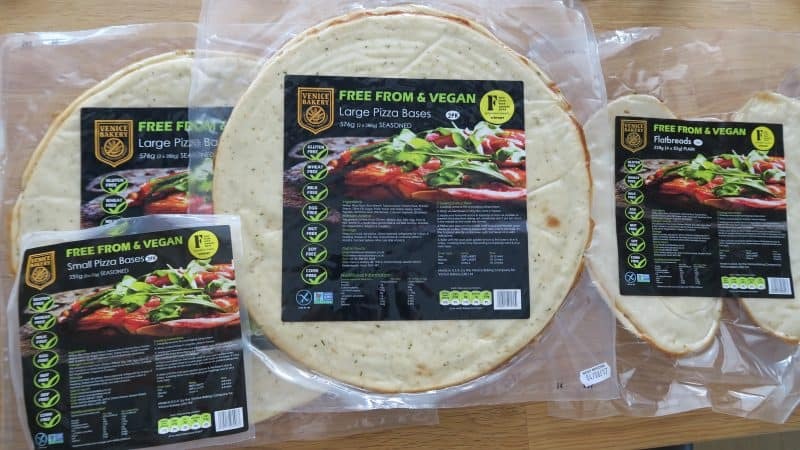 I absolutely LOVE Venice Bakery and their gluten, dairy, egg, soy and corn free pizza bases were on my ‘to-buy’ list before I even got to the Allergy and Free From Show! They had a ‘buy three, get one free’ deal so I picked up two large pizza bases, a pack of flatbreads and some mini pizza bases too. 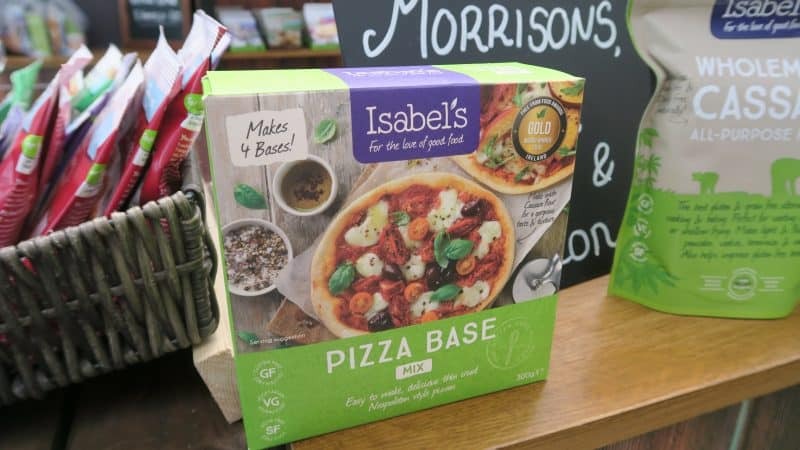 The thing I love the most about their gluten free bases is that they are a decent size – finally a big gluten free pizza! 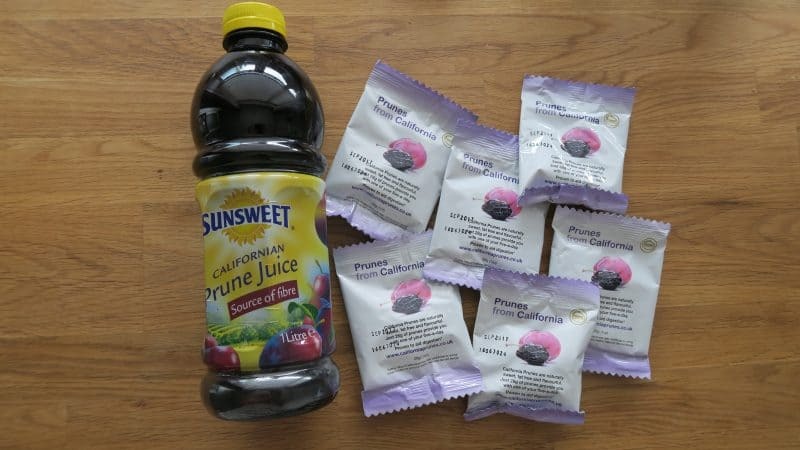 Now I know prunes are not the sexiest of fruit, but they’re incredibly good for your digestive system and when the team at California Prune kindly offered me some samples to try, I was intrigued. The recipe book they gave me had some fantastic ideas – I can’t wait to try the prune and halloumi skewers! I love using new foods in my cooking and I’m excited to experiment with these and see what I can come up with. I was sad I didn’t get time to stop by the MannaVida stall to try their bread, though I did have a brief encounter with them at the bloggers’ meet-up. This focaccia mix sounds amazing and really simple to make. 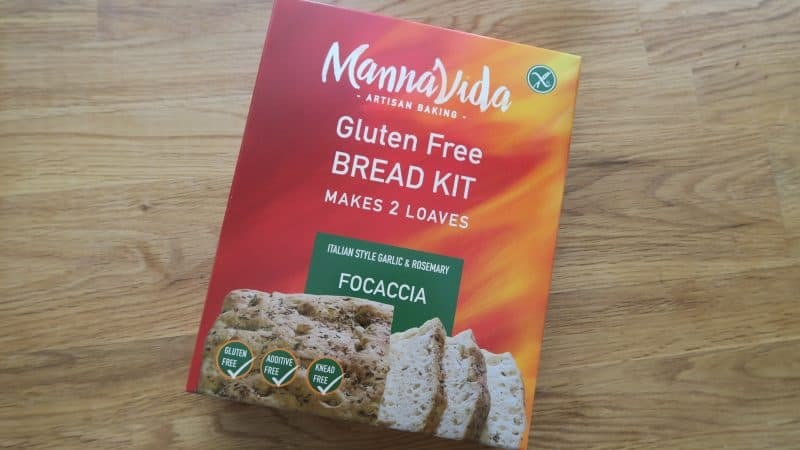 Again, I haven’t made gluten free bread much before but this gluten free bread mix looks so easy to follow, I think it will be one of the first things I test out when I get back home. 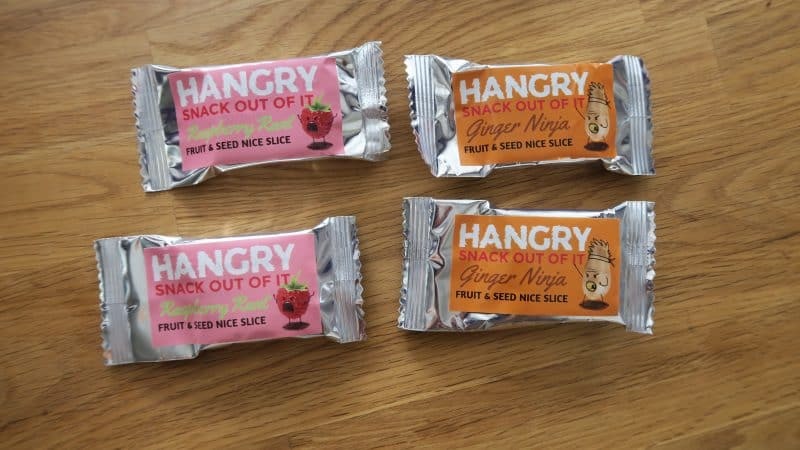 I love Hangry – their branding is so awesome and their bars are so full of flavour. I find a lot of ‘healthy snack bars’ all taste the same, but not these ones! The new flavours – Raspberry Rant and Ginger Ninja – are launching in September and I can’t wait. Luckily XXXXXXX gave me some samples to take home with me to keep me going until then! The ginger ones are lovely but the raspberry ones are out of this world. Angels and Cookies was another brand I was really excited to meet. Ready-made gluten free cookie dough seems to be relatively hard to come by, but not only is this a gluten free cookie dough, it’s also free from dairy, egg, soy and a whole other lot of allergens too. 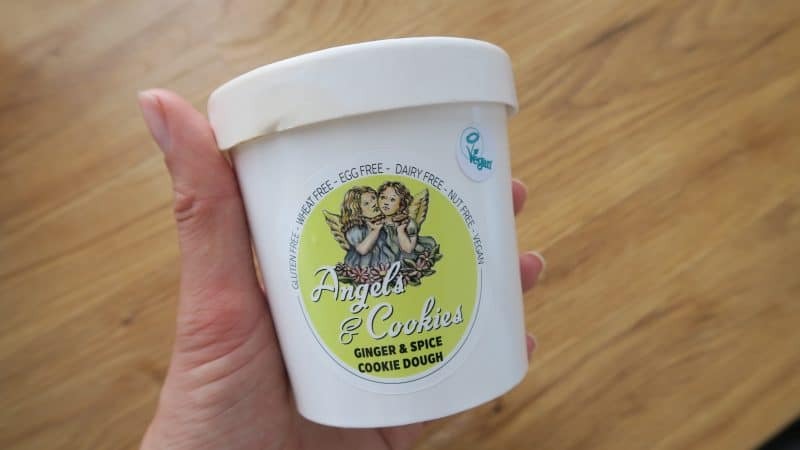 There was such a lovely, friendly team on the Angels and Cookies stand and I was very happy to bring home a tub of the ginger spice cookie dough. I love eating it raw so not sure if it will make it as far as the oven though! This veggie’licious gluten free and vegan samosa from Green Sisters was another goodie I picked up in the blogger meetup. It had a lovely flavour and the texture of the samosa was delicious. 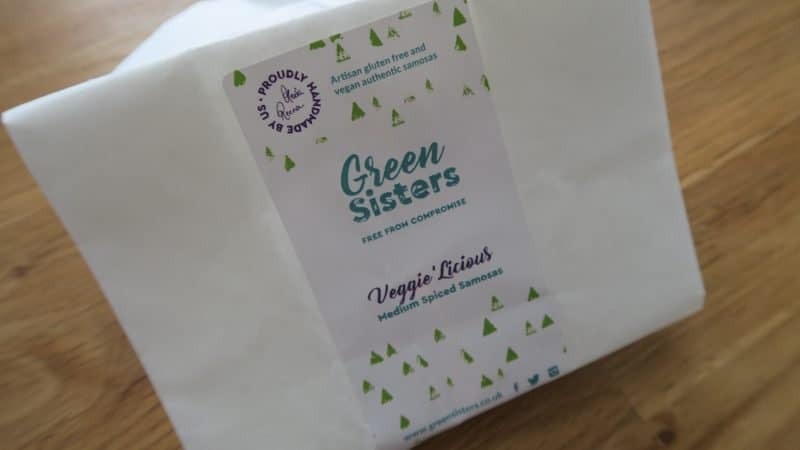 I had a quick chat with one of the Green Sisters and they seemed so passionate about making delicious, gluten free Indian food. I’d love to see them stocked in a deli near me. 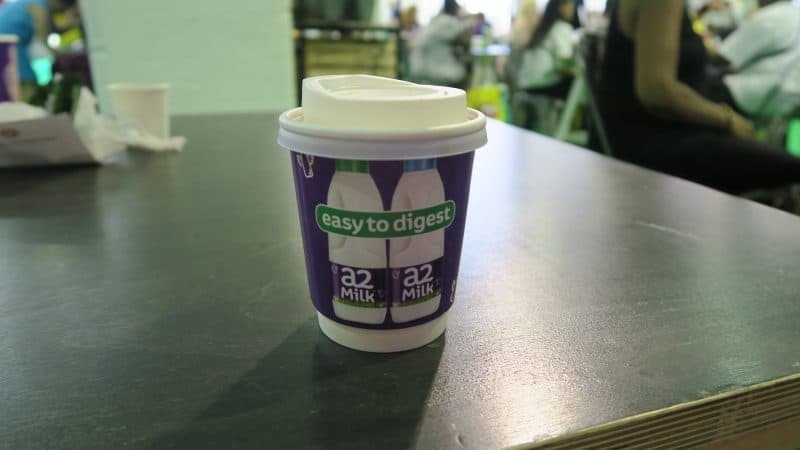 I ran a giveaway with a2 Milk ™ before the Allergy and Free From Show, and stopped by their stand for a coffee each day to keep my energy levels up! Their milk is designed for people who have some digestive issues with milk (though it’s not suitable for those with a milk allergy) and their coffees were delicious at the show. After two days lugging round a lot of heavy bags, it was nice to stop by the Free From Café and relax! Isabel’s was one of the first brands I ever reviewed back in the day, and it was amazing to finally meet Isabel herself! She was SO lovely and it’s brilliant to see a brand you love with such a prominent stall, and doing so well. Her gluten free mixes are made with cassava flour and I tried some of the waffles she had made for the show – they were amazing. B-Tempted is another brand I have been speaking to for years, and it was great to finally meet the team. Their cakes and brownies have won loads of awards and they were kind enough to give me a box of goodies to try. It’s nice to see smaller brands succeeding and it sounds like they are definitely ones to watch. This year Tesco ran a tasting event, which I thought was a brilliant idea! It was a chance to sit down and eat some proper food, testing out their new free from ready meals. I have actually tried and reviewed these before it was really interesting to be able to sit and discuss my thoughts on each course with like-minded people. 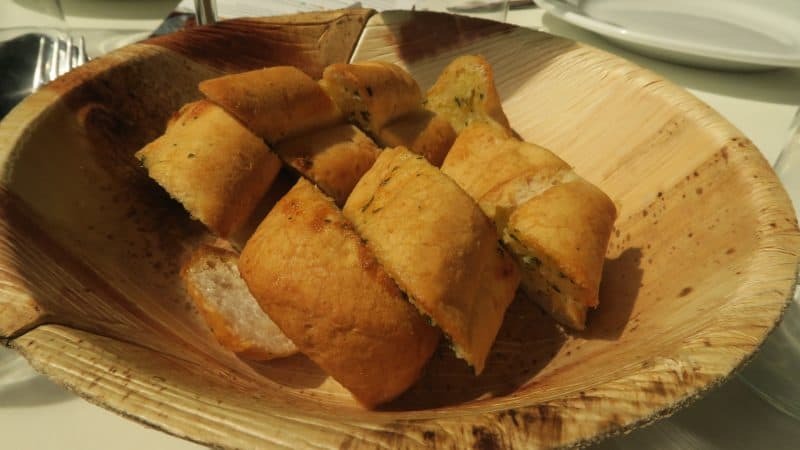 The gluten and dairy free garlic bread was definitely my favourite. 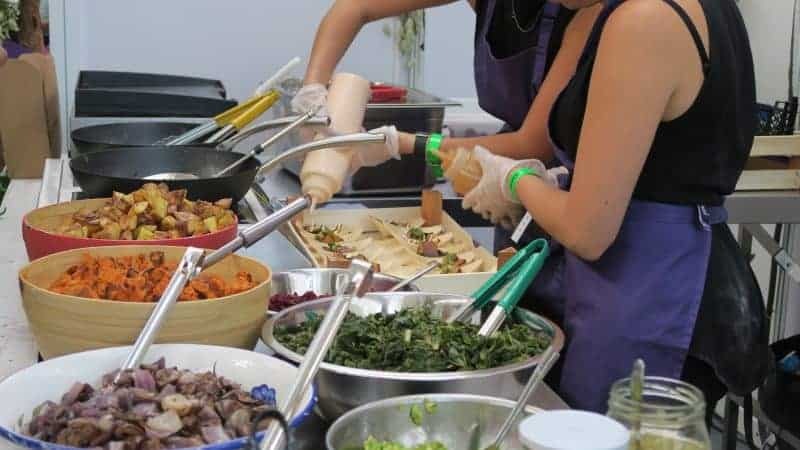 Did you go to the Allergy and Free From Show in London this year? What did you think? 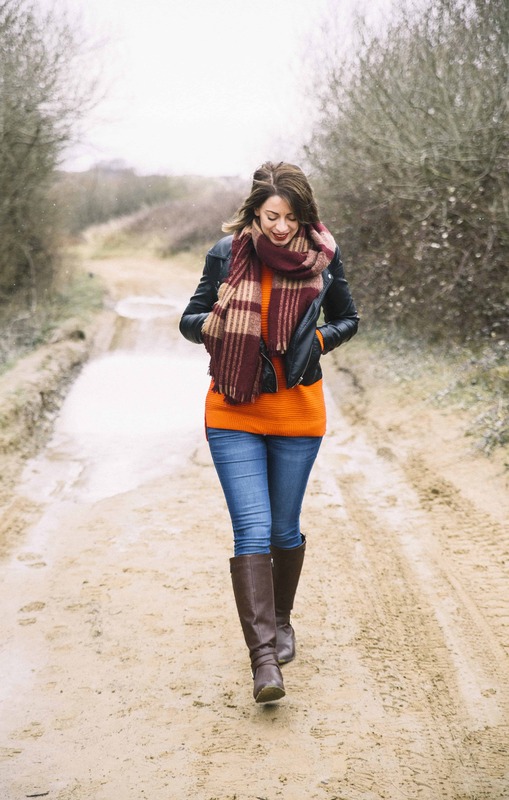 And what was your favourite find of the weekend? I’d love to know if there are any amazing brands I missed by commenting below or on my Facebook Twitter and Instagram pages! I’m jealous! I thought we had a pretty good selection of GF goodies here in the Seattle area, but I think you have a lot more variety. I’ll just have to pay you guys a visit :0). Actually, I’m headed to Ireland again soon and found Dublin to be incredibly easy for gf eating but now we’re going to venture to the countryside~ Any advice on Ireland?